The stalemate over the projected $5 billion deficit has the state headed toward a possible government shutdown. Both Gov. Mark Dayton and the GOP-controlled legislature have offered budget solutions, but the numbers each are using to make their case paint different pictures. The Republican talking point started near the end of the legislative session and has been repeated often since then. "We did what we said we were going to do," said Senate Majority Leader Amy Koch, R-Buffalo. "We came here to pass a budget that did not raise taxes, that lived within our means. It does have $3 billion in additional revenue." During conversations with constituents, email blasts to supporters and during news conferences, GOP lawmakers insist they're increasing spending in their $34 billion budget plan. State Sen. Roger Chamberlain, R-Lino Lakes, is one of the many Republicans who say their budget spends more than the current two-year budget. He said Republicans propose to spend $34 billion in the next two years, up from $30.1 billion in the last biennium. "Thirty-seven billion dollars is the number the governor has proposed to spend," Chamberlain said. "$30 billion, $34 billion, $37 billion -- tell me, where is the middle?" Dayton revised his budget plan in May to spend $35.8 billion. Technically, Republicans are right when they say the state is spending $30 billion in the current budget cycle, but they're also leaving something out. They're careful to use the term "state spending" because that's the amount of spending coming from state coffers, but that's not the total that's being spent on state operations and programs. The federal government kicked in $2.3 billion from the stimulus law that is funding state programs, and the state delayed paying schools $1.9 billion. Factor in those numbers and spending this biennium just about equals the $34 billion Republicans are proposing for the next biennium, but expenses are going up faster than revenues. "Our revenues didn't increase enough to allow us to make up the federal subsidy plus the one-time savings that we got from the K-12 shift," said State Economist Tom Stinson. "On an apples-to-apples comparison, you're going from $34 billion to $39 billion." Stinson said the main reasons for the increase are higher health care costs, more people needing subsidized health insurance and more children enrolled in K-12 schools, he said. Holding back the money for schools would keep the budget at $37.6 billion, he said. Gov. Dayton and GOP lawmakers rely on different sets of numbers to emphasize their positions. Both sides agree on extending the K-12 budget shift and cutting spending by $1.8 billion, leaving a $1.8 billion funding gap. Republicans, like Sen. Koch, say Dayton's proposal to increase income taxes on top earners isn't needed because the state is bringing in more revenue. Koch said Republicans aren't willing to spend more than that even if it means cuts to higher education, services for the disabled and the state's workforce. She insists spending under the GOP budget isn't flat, because higher tax collections will make up for the end of the federal stimulus. "We have $3 billion in additional revenue this biennium," she said. "But what we've got in the checkbook is what we have to spend. The exact same as Minnesota families." Gov. 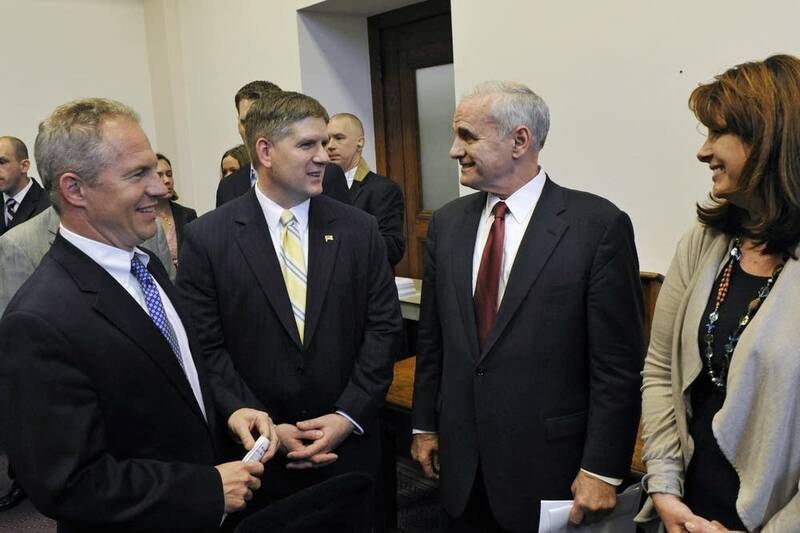 Dayton is betting the cuts proposed in the Republican budget will be unacceptable to Minnesotans. He said he won't agree to erase the projected budget deficit through spending cuts alone. He also said he's not just raising taxes for the sake of raising taxes. "I'm raising taxes because the alternative, their all-cuts budget, is so drastic and so extreme and so harmful to so many Minnesotans that I'm simply asking the wealthiest 2 percent, who studies show pay less than anyone else in Minnesota in their state and local taxes, to pay closer to their fair share in this critical situation," Dayton said. But with a state government shutdown on the way in less than a month, it's hard to see how the two sides will reach an agreement anytime soon. The first task may be to agree on how much the state is currently spending. Dayton and the Legislature have until July 1 to reach a budget deal.